Jobu examines the upcoming fight between Saúl “Canelo” Álvarez and Floyd Mayweather, Jr. In case you haven’t heard, Floyd Mayweather has signed his next fight. If you follow boxing, this fight choice might bewilder you, but it definitely has earned Floyd some more respect from me. He’s already, pound-for-pound the best boxer in the world. That’s my opinion, but it’s probably pretty hard to refute the argument. By choosing to fight young Canelo Álvarez, Mayweather is seemingly trying to make sure he backs up that opinion in the ring. He mentioned when he announced the fight that he wanted to give the fans what they want and, although i’m sure he’ll also be taking home more money than I’ll ever even smell, it seems that Floyd wants to finish his career with real fights against worthy opponents. Frankly, it’s very ballsy, and very impressive. So who is Álvarez and how serious a contender is he to take down “Money” Mayweather? We actually wrote about him in the early days of Jobu’s Rum. You can check it out here, but we introduced him to our readers as one of the better up-and-coming young boxing prospects in the world, and pointed out that, if you saw him on the street, you’d never guess he was Mexican (I mean just look at the kid). At the time of our profile, he was coming off a severe beatdown of Ryan Roads for his 37th win in 38 fights (1 draw). Since then, he’s kept moving forward, scoring huge wins over the likes of Kermit Cintrón and Austin Trout on his way to compiling his current 42-0-1 record. Put simply, the kid can hit. At 22, he’s 14 years younger than the 36-year-old Mayweather. However, he has a ton of experience, as he’s been a professional since age 15, which is pretty crazy. He’s also fast with his hands and packs quite a wallop when he lands his punches. If he can catch Floyd with a couple of good ones, the champ might end up on the mat for only the second time in his illustrious career (technically, Mayweather’s never been punched to the ground. Twice his hand has touched the ground, only once was it called a knockdown). Unfortunately for Álvarez, catching Mayweather is one of the toughest things to do in all of boxing. 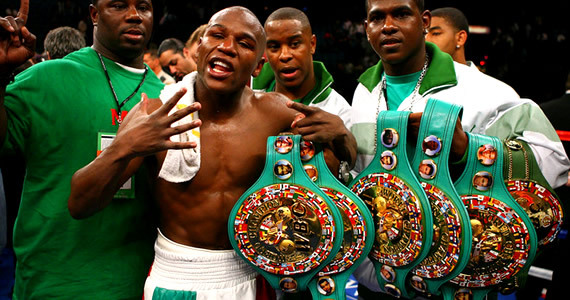 Mayweather is one of the quickest fighters of any weight class, and if you happen to get him in your sights to throw a punch or two, his defense is often nearly impenetrable. He’s also one of those guys that, if you like humble fighters, you’re not going to list him among your favorites. You’ll probably root harder for him to get tagged by a good right hook than you will root for the guy doing the hypothetical tagging. But, if you watch him go about his business in the ring, especially with his recent choices to fight the likes of Miguel Cotto and Robert Guerrero, you’ll come away respecting his ability. He’s brash and sometimes cocky, but he backs up the big talk in the ring. He’s also a hell of an entertaining guy. Have you watched the coverage of his fights on HBO’s 24/7? Great stuff. Unlike many boxers, father time does not seem to be catching up to Floyd like it has for guys like “Sugar” Shane Mosely and Manny Pacquiao. Also unlike Rocky in Rocky III, Mayweather isn’t taking fights with nobodies just to keep his titles and cement his legacy (THEY WAS SETUPS!!). He takes fights against younger, and perceivably stronger or quicker, opponents and he whoops them all. Against Cotto, he proved that he’s not just a evade and pitter-patter type boxer. He stood toe to to with Cotto and took the Puerto Rican fighter’s best shots in what was, in my opinion, a pretty thrilling fight. Some “experts” weigh in on the fight. 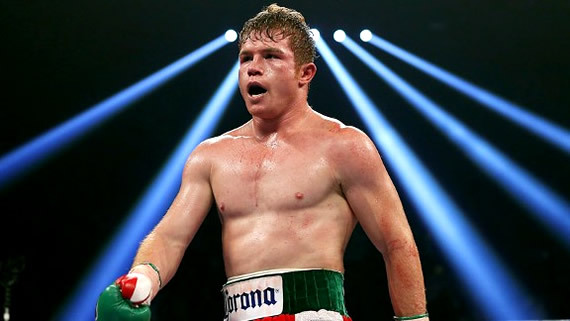 I think, at this point, if anyone’s going to unseat Mayweather, it’s got to be Canelo Álvarez. In our last post, we pondered if he’d be the one to dethrone Manny Pacquiao. Clearly that’s been done. Anyway, I’ve seen Álvarez fight. He’s no joke. He’s young and strong, and the fight itself favors him. The fight will take place in Floyd’s home town of Las Vegas, NV, in Floyd’s seemingly favorite place to fight (the MGM Grand), but that might be the only outside force that Mayweather has in his favor. The fight will take place on Saturday, September 14th, which also happens to be the same weekend as Mexican independence. You know that, in a city named Las Vegas, there might be a couple of Mexican or Mexican-American fans that will come out to root for their countryman on the weekend of their independence. I predict Canelo will have a huge home crowd type advantage, which can really help motivate a boxer. I think Canelo will fight the fight of his life, and has a definite chance to take home a victory. However, am I stupid enough to bet against Floyd Mayweather at this point in his career? Absolutely not. I’m torn on who I even want to win. Álvarez is a star in the making, and i’d hate to see his rise to the top take a step backwards with a key loss. However, he is only 22, which will leave him with a ton of time to get back on the climb. At the same time, Mayweather might not have that many fights left in him. There’s a huge part of me that wants him to go out undefeated on his own terms as possibly the best pound-for-pound boxer ever. I don’t want him to go out like Manny Pacquiao, face down on the mat bleeding (although Pacquiao will fight again, unfortunately). Here’s hoping for a great fight in September. I’m sure it won’t disappoint.